Its a funny thing, but a big part of feeling settled in a new place is knowing your way around the grocery store. This goes double for a foreign country. In my case, I now have access to an entire freezer section of Yorkshire puddings (seriously), but I can’t buy caramel ice cream topping. I can get rich tea biscuits and digestives any time I turn around, but granola bars are off the menu. I’m trying to embrace the offerings at our local Tesco, which is enormous. But every once in a while, I see the most ridiculous things on offer. I chronicled some of my favorites in one of my very first posts back in September, but there are plenty to choose from, so here is I was that weird foreigner in the grocery store: Round 2. The collage shows potted beef (ew), Simpsons donuts (because donuts are a 100% American thing, the Simpsons provides a frame of reference. Although Krispy Kremes are really popular, too…), “American style” hot dogs in brine (really? 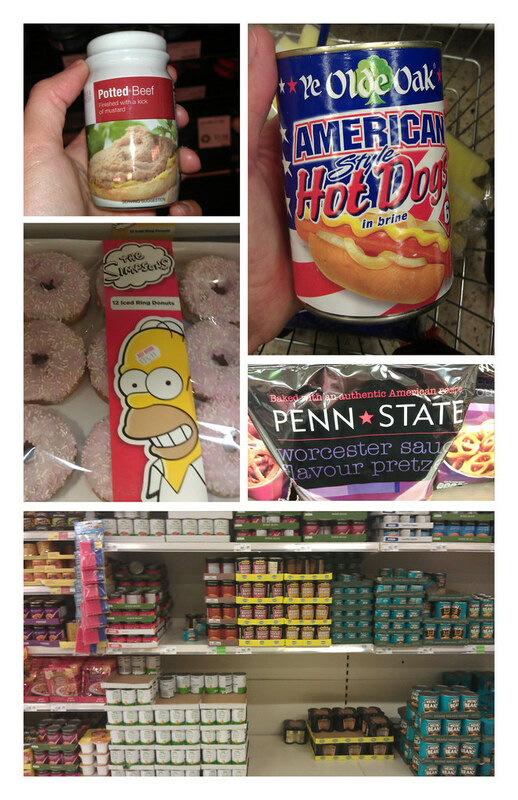 ), Worcestershire-flavored “American style” pretzels, and a portion of the Heinz beans section at our local big box. I love wandering the grocery stores here and seeing all the “new” things. Oh I totally agree with you on that. I posted some foodies at http://ordinaryandoddinary.wordpress.com/category/cooking-baking/ so if you ever come to Spain, check them out too! hey hey HEY! Have you HAD beans on toast? 2) After work, go out and get really drunk. Who with, where, on what, donesn’t matter. You don’t even need to have a good or bad time. 3) Wake up the next morning with a massive hating hangover and trudge into the kitchen. Kettle on. Tea. 4) Toast. Butter. Beans in the microwave. 5) Eat in front of Saturday morning TV. The only way to eat beans on toast. Granola bars! When I lived in Dublin they sold these chewy chocolate covered granola bars called flapjacks… Do they not have those in England? Or are you looking for healthier granola bars (i.e. not a cookie in disguise)? What the heck is Worcester sauce? Some kind of specific, densely-populated subset of Worcestershire sauce?